This activation was planned by Phil G4ODK and Nick G4OOE to finish up the first day of the Friedrichshafen HAMRADIO event trip. I had contacted Phil and asked it I culd tag along and in the meantime Peter OK1CZ had also asked for a ride. So we took two cars with Phil & Nick in one and Peter and myself in the other. We all took our own SOTA gear to use. I had hoped to try out the new Aerial-51 wire antenna and DX-Wire 10m mini-mast that I had bought at HAM RADIO but decided it was better to rely upon the usual equipment. Pfänder is above the Austrian town of Bregenz which is just over the border with Germany on the banks of Lake Constance. Nowadays there are no operational border posts as both countries are members of the EU but to avoid autobahn tolls we took the old route which passed the old, now unused border posts. To use Austrian autobahns you need a sticker that lasts for a full calendar year. I have one on my car but Nick did not have one on his and there is no justification to pay for a years usage for a run of about 3km down the Autobahn. Access to Pfänder is well signposted on the road up from Bregenz. 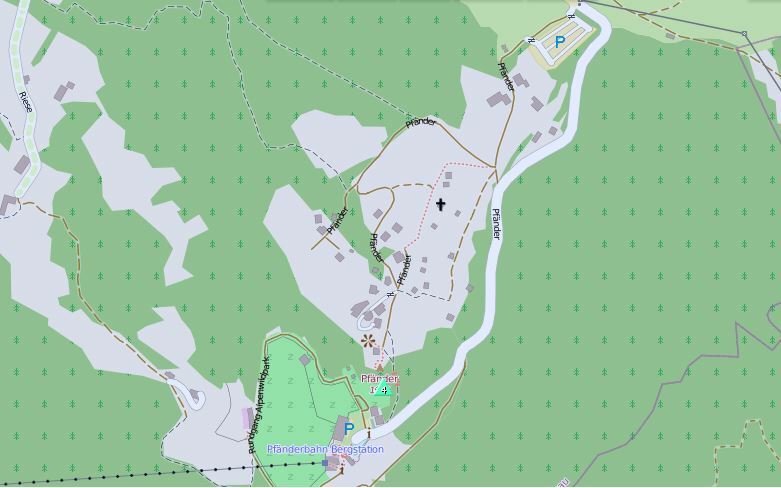 The public car park (1 Euro per hour charge) is probably about 500m horizontally and 50m vertically away from the summit. There is a restaurant nearer to the summit and the top station of the cable car with it’s own car park but that road has a metal bollard that can be raised blocking the route (this almost caught Nick & Phil out as they drove to that car park not the main public one). The run took longer than the expected 35 minutes from Friedrichshafen due to a lot of traffic however OE/OK1CZ/P and OE/VK2JI/P we operational on schedule at 15:30 UTC and Phil OE/G4ODK/P and Nick OE/G4OOE/P soon after. To stir up some activity I had decided to use my Australian call rather than my German one this time. When outside of Germany, I can chose any of my valid calls from CEPT member countries, so I could have used G8GLM or DD5LP also. Pfänder has several good spots to set-up and I chose one directly across the path from the TV transmitter tower. Surprisingly I had no interference at all from it. Herbert OE9HRV who lives in Bregenz, below the Pfänder mountain, and is a SOTA activator, came up to say hello when he saw we were activating. He told me he had had interference from the tower previously. 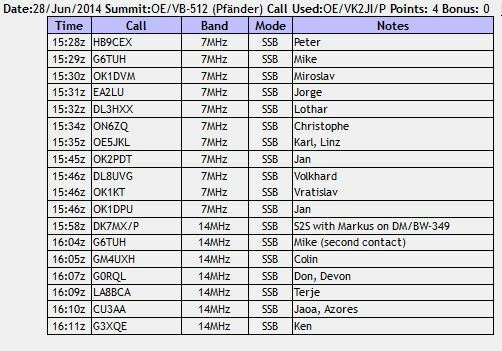 I managed 18 contacts across 20 & 40m SSB, including one S2S contact (log below) despite the fact that the QRP Amp was not working and I was running, at best, 5w output. (I later found that the fuse inside the amp had blown, whether from a surge or a fault will need to be investigated once I get some replacement fuses). At the end of the activation Herbert suggested a nice restaurant with a remarkable view out over Lake Constance and all five of us headed there for a great meal, a couple of beers and a good chat about SOTA and Amateur Radio in general. As I had driven down to Friedrichshafen, early that morning, after dropping Peter back to his lodgings I was ready for a good sleep at my hotel, to prepare for another day at HAM RADIO and as it turned out another SOTA activation (DM/BW-349 Aacheck) on Saturday. An enjoyable activation. I normally activate alone, so it’s a nice change to have company and Herbert joining us on the summit was a bonus. It would have been good to have the 2.3KHz roofing filter in the the FT817 that I had bought earlier in the day to handle the QRO stations near the frequency but I decided to delay taking the rig apart until I got home and had the appropraite tools available. Don’t assume equipment is working just because it has worked on several previous activations. It’s better to run barefoot than have a non-working amp in circuit losing a DB or two of signal both on TX and RX. This entry was posted in SOTA and tagged OE/VB-512, Pfänder, SOTA by VK2JI DD5LP G8GLM. Bookmark the permalink.